Gmail is one of the best free email service with new features being constantly added. You can undo sent email in Gmail, add an image to Gmail email, send email in regional language, and much more. Gmail also supports advanced search operators that help you find any email in Gmail easily. Still, Gmail is far from perfect as it lacks many features like an ability to send a future email, that is, scheduling an email so that its sent at a later date automatically. 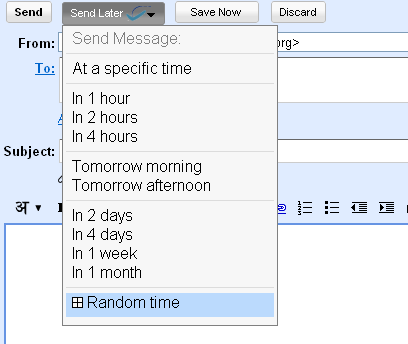 Even if Gmail doesn’t support email scheduling, you can use Boomerang to schedule email messages in Gmail which will be then sent after a specified amount of time automatically. Boomerang is a Firefox/Chrome extension which you can install here. Once you install it, a new Send Later button will appear on your Gmail interface. You can then use it to schedule your email message. Now, if you are concerned about your email account’s privacy, then there is no need to worry. Boomerang uses OAuth for authentication, which means that it doesn’t store anything from your email message. To send an email at later date, it just stores the email header which contains the information such as subject, sender and the time. Then when it has to actually send an email, it uses OAuth to authenticate, and sends it from your Gmail account. Check out the video below that explains the email scheduling in Gmail.